This week there are two different Make-A-Meal deals going on at Winn Dixie! 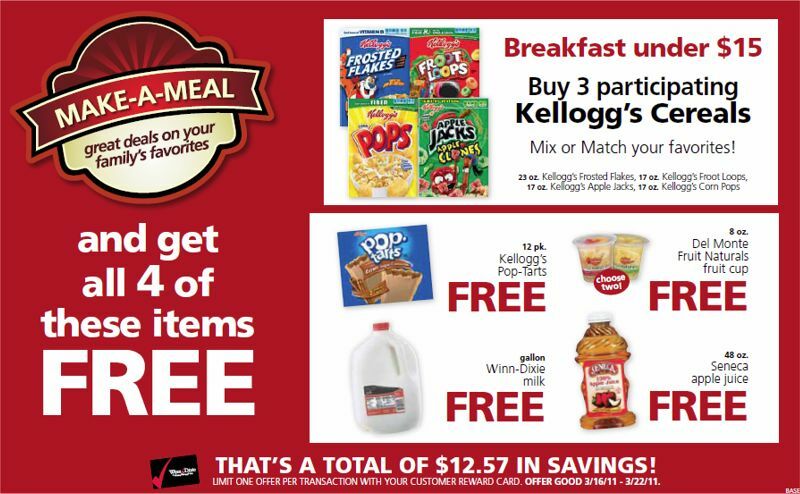 Start your day off right with these Kellogg’s breakfast favorites and save $11.23 before coupons! If making healthier choices this New Year is one of your resolutions then this Make-A-Meal deal featuring Weight Watchers products is for you! 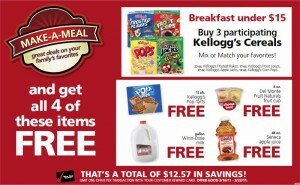 Offer valid 1/11/12 through 1/17/12, limit one offer per transaction with your Winn-Dixie Customer Reward Card. 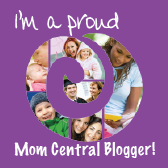 Save $11.76 before coupons! 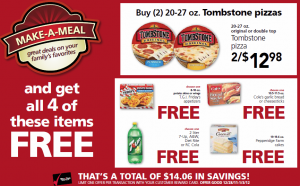 Winn Dixie’s Make-A-Meal deal for this week includes Tombstone, T.G.I.Friday’s, and Cole’s products, plus your choice of 7-Up, A&W, Diet Rite or RC Cola. You can save $14.06 before coupons! Offer good from 12/28/11 – 1/3/12. 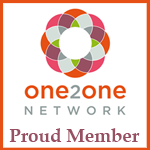 Limit one offer per transaction with your Winn-Dixie Customer Reward Card. In addition to Winn Dixie’s breakfast Make-A-Meal deal for the week of 3/30 through 4/5, they also have four great Double Play deals. Quaker quick grits, 36.8 oz. Pillsbury Grands! biscuits, 12 oz. Simply…buttermilk biscuits or 8 ct.
That’s $8.96 in savings before coupons! 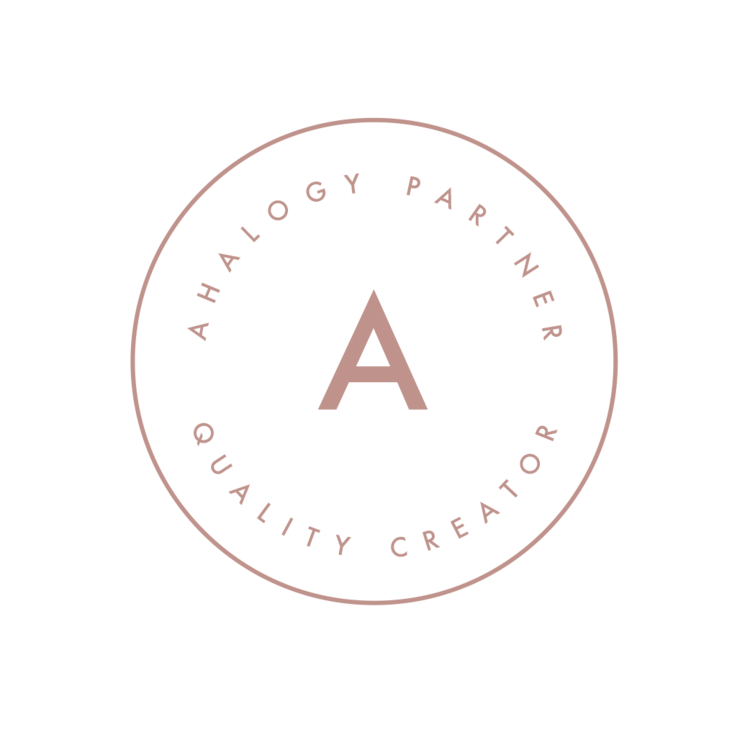 Offer good 3/30/11 – 4/5/11. Here are the double play deals – you can click the images for a larger view. 2 Del Monte Fruit Naturals fruit cups, 8 oz. Seneca apple juice, 48 oz. That’s $12.57 in savings before coupons! 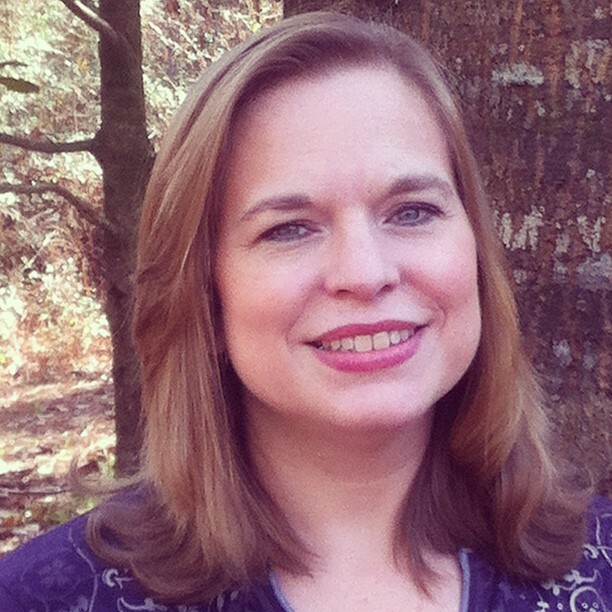 Offer good 3/16/11 – 3/22/11. Ore-Ida French fries, 26 oz. Kraft tartar sauce, 12 oz. Pepperidge Farm cake, 19.6 oz. Winn Dixie’s Make-A-Meal special is pretty awesome this week! 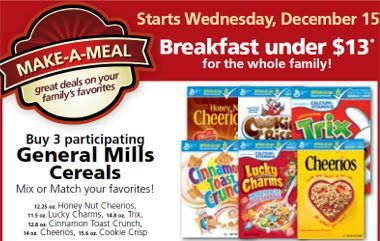 Buy 3 participating General Mills cereals, mix or match your favorites, and you’ll get the following four items for FREE! Winn Dixie’s Make-A-Meal deal is back by popular demand! 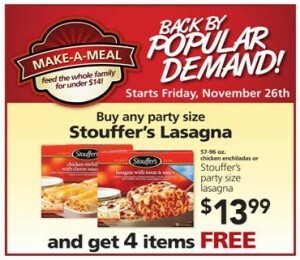 Starting on Friday, November 26th you’ll get four items FREE when you buy any party size Stouffer’s Lasagna for $13.99. The four free items will vary by region, and the ad hasn’t been posted yet so I’ll update you as soon as that info is available. In the meanwhile, if you’re sick of turkey by then this will make for a quick and easy meal!